As Republicans take control of both chambers of Congress for the first time since 2006, their leaders, like new Senate Majority Leader Mitch McConnell, have been promising to become more productive, especially in advance of the 2016 presidential elections. But after years of fierce partisan warfare, Americans are deeply skeptical that more will get done in Washington. About three-quarters (76%) of those who cited a top national problem said they did not think progress would be made by President Obama and GOP leaders to address the problem they mentioned, according to a Pew Research Center survey conducted in early December 2014. And there, at least, was one point of partisan agreement. That dim view was shared by 78% of Republicans, 71% of Democrats and 80% of independents. Some of the same challenges that plagued the last several gridlocked years continue or have gotten worse. 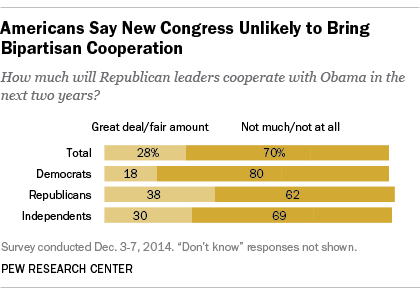 Partisans on both sides see little prospect of their leaders engaging in much cooperation. And the Republicans — despite their command of Capitol Hill — still face rifts in their ranks between conservative hardliners and lawmakers more open to making deals. One sign of the tensions still brewing within the GOP over shaping its agenda was the fact that House Speaker John Boehner again faced a band of Republicans opposed to his re-election as speaker. A Pew Research Center survey in early December found Tea Party Republicans and supporters among Republican-leaning independents evenly divided about his leadership: 45% viewed him favorably and 43% viewed him unfavorably. Few Americans are expecting much cooperation between parties despite talk that Obama and the Republicans might be able to find common ground on some issues in his last two years in office. Just 18% of Democrats believed that Republican leaders would cooperate a great deal or fair amount with the White House and 37% of Republicans shared that view. A majority of Americans in the December poll believed the next two years promises to bring more of the same political polarization that provided the backdrop for past battles in Congress, and between the Congress and the White House. About eight-in-ten (81%) Americans saw a country that was more politically divided than in the past. 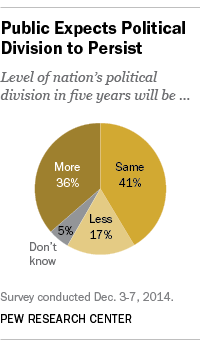 Looking ahead, 36% predicted the divisions would deepen in the next five years while 41% said they would remain the same, and 17% foresaw less division.